A real nice MS-DOS palmtop from 1992, but with slow PIM. This was my first palmtop machine, bought in October 1992. It proved amazingly handy, despite flaws. Biggest problem. Too large to carry in a pocket, so it wasn't always with me. That was the problem Jeff Hawkins addressed with his Palm Pilot. Secondary problem, the PIM software provided by DIP was too slow to use, and had to be replaced by DOS applications. I continued to use it until April 1995, when it failed (software glitch wiped my contents, not hardware) just prior to an overseas trip and I bought a replacement system during that trip. Despite being very battered, the Sharp still works as well as ever. I gave it to another enthusiast in 1999, and it was still working in 2000. 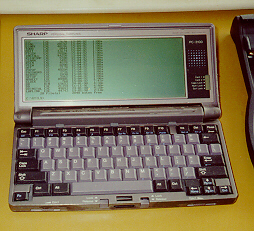 This is a Japanese clamshell palmtop with a subset of Microsoft's MS-Dos 3.3, a small number of utilities, and an English DIP designed PIM in ROM. This is at the limits of palmtop size, being 222mm (8.7") by 112mm (4.4") by 25.4mm (1") thick, giving a volume of 610 cc. The weight is 480 grams (1.1 pound). No way can you really put it in a pocket - not and still walk! The display is a 640 pixel by 200 pixel supertwist LCD, a total of 128,000 pixels, configured as CGA, in either 40 or 80 column, with 4 gray levels. The display size is 172mm by 66mm, or 183mm diagonal. The standard 8 x 8 character set is thus 2.15mm high and 2.56mm wide per character. LCD adjustment is via software. The display is very nice indeed. Best I have seen on a palmtop, apart from the much smaller Psion 3a. It makes me wonder why we had to wait until the late 1990's before anything much better appeared, and then at the expense of high power consumption and poor battery life. As with most palmtops, the keyboard occupies almost all the body size. The key spacing is 14.8mm (a standard IBM computer keyboard is 19mm). There are 77 keys. The numeric keypad is part of the alpha keys, and can be switched on via the numlock key. The cursor keys are in inverse T, and the Fn key is used to access home, end, and pg up and pg dn. There are only 10 function keys, with F11 and F12 being accessed via the Fn key. A recessed "reset" switch, which can only be reached with a fine pointer such as a paperclip, is on the underside of the case. I'd rate the Sharp keyboard as possibly the best available on any of the palmtop machines, except for the Psion 5. It is therefore even more of a pity that it includes bugs, like locking up the entire system if a key is held down for more that 30 seconds. The processor is an 80C88A running at 5 MHz or 10 MHz. No AT or 386 CPU actions are available, however an EMM memory driver is provided in ROM. Normal clock rates are 5 MHz and 10 MHz, however you can use custom software to clock from 1 MHz to 8 MHz. Memory is 1 or 2 megabyte of pseudo-static RAM, with the excess over 640k available as emm and ram disk, backup by the main batteries. There is 128 kb of SRAM in the video ASIC area, half used for video and half for the D: drive, which is backed up by the Lithium backup battery. There is a 128 kb OTP-ROM for IPL, BIOS and the power-on check. There is a 1 megabyte Mask ROM containing MS-Dos 3.3, the DIP PIM software, Laplink, diagnostics and utilities. Two Type 1 PCMCIA card slot are included. I was unable to make any PCMCIA card operate until I formatted them in a different machine. The system does not include PC Card Socket Services, however 1 MB and 2 MB SRAM cards from FDK, Grid, Apple Newton and other systems worked fine once they were formatted by other machines. Flash memory cards from a Newton did not work. Sharp indicate you should be able to use Flash as Read Only. I found a 1995 note saying you could use a 5MB HP flashcard provided you use a device driver SDPDIP.SYS. I sort of assume this comes from DIP, the people who designed the Sharp software. The PC3100 uses three AA alkaline batteries. It is not suited to rechargable batteries, although a few people have used them. The backup battery is a CR2016 Lithium. You can supply 6.3 volts DC from an external adaptor, if you can locate the Japanese style DC plug required. You can set a power down mode, however there is no provision for having a different mode when running off external power. This seems a silly thing to neglect. The DC power adaptor is not a universal input style, so it is no use when you travel overseas. The batteries seem to be good for about 30 hours power on time, if you are very careful. Running from the DC pack overnight and most of the time at work, I was getting about 6 weeks from the batteries. Power consumption (from the mains) in suspend mode was 5.3mA, with a clear display 41.4mA, with a screen full of text 49.6mA, jumping to 165mA while updating the screen. At system setup it was 45.7mA. If you turn off the low power mode, a cleared screen dos prompt draws 185.8mA. Changing the display from lighter to darker increases drain by 1mA. If the external floppy drive is connected the suspend current increases to 16.3mA, the clear screen current to 190.5mA, and the current while reading the floppy to between 0.4A and 0.55A. There is a non-standard 10 pin RS232C serial port, and a non-standard 20 pin D parallel printer port. The pinouts are documented in the Operation Manual. The parallel printer port adaptor cable lacks some ground lines, however if you modify the custom (and expensive) Sharp 20 to 25 pin adaptors, you can run a Trantor parallel to SCSI adaptor to work a SCSI hard drive. The serial cable adaptor seems to provide a standard IBM AT 9 pin outlet. Although Sharp claim 9600 baud, some software will run it at up to 115,000 baud. There is provision for an external floppy drive. Sharp formerly made an (fairly expensive) external floppy drive, and this works reliably. Battery life of the external floppy drive is really pathetic, so you would probably chose to run it off a mains adaptor at most times. The DIP supplied PIM software seems reasonable, although a little primitive compared to later palmtops. However it was obviously never tested in real use. Whenever you put large quantities of data or text in a file, it slows downs to an totally unacceptable degree. I found the PIM editor and database to be no earthly use due to this. In addition, the PopUp routine has a hard coded pointer to the MS-Dos command.com, so if you replace command.com, you can not use many of the facilities. This is an idiotic decision in an MS-Dos machine. There is a nice thick A5 wire bound 14 chapter Operation Manual. Covers the basics, setting up, starting, introducing the applications, using the applications, and then has chapters on the PopUp menu, using MS-Dos, the LapLink utility, the address book, the scheduler, the editor, the file manager, and the worksheet. Sharp produced a Service Manual, code 00ZPC3000SM/E. Twelve chapters, nicely technical, about 70 A4 pages, with full schematics, and a lot of detailed material about the interior of the PC3000. Sharp sold me my copy for A$25, after I told them I was unwilling to buy the PC without a service manual. Later on, they told me that I shouldn't have a copy. This sort of obstruction really isn't helpful. AC adaptors various input voltages (6.3 volt DC output), 3.5 inch 1.44 mb external floppy disk drive unit, parallel converter cable, serial converter cable, laplink cable. The model I checked was S/N 23006646. Please note that I have not had any Sharp material since 1999, having passed it along to other enthusiasts. From a Unix dialup, check whether the uqwk command is available, to batch email and news into a single package for downloading and offline reading using a "soup" packet reader.